Kevin Laye is a successful Harley St Therapist. In 2003 Kevin saw over 600 clients for smoking cessation. The methodology he employs has an 87% success rate* (measures taken from clients in the 2003 period after a 6 and 12 month follow up). 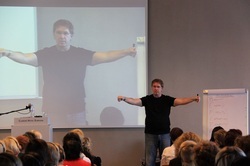 Kevin is a Master trainer of Hypnosis, NLP and TFT. By using a cocktail of these techniques plus adding a few of his own Kevin obtains a very high success rate in enabling his clients to become non-smokers. During this Master Class you will be taught everything Kevin uses with his clients and be given handouts to enable you to adopt and apply the same techniques in your practice and be given practical demonstrations during the workshop. These formulae can be applied to any addiction from chocolate to crack cocaine so it is more than just a regular no smoking class. I charge my clients £1000 to become a non-smoker. What’s stopping you? Kevin Laye, "Positive shrinking" and "Positive drinking"
2. The registration will be confirmed only if this module is correctly filled in and signed and only after Mekaks OÜ will have received the payment. Registration 14th Oct "Smoking Cessation Master Class"